The Miss Priss Pink Moscato, Wood Duck Chardonnay and Triple Threat Red Blend. More Marketing Gone Wild Or The Real Deal? These are not wines for wine aficionados trying to add to their grape count, but they are what I would call stepping stone wines. In other words, wines that bring new wine drinkers into the market, some of which will go on to become drinkers of wines with much less mass market appeal. Either way, as we declared in our Ten Tenets of Reverse Wine Snobbery, “Drink what you like!” With that, let’s get on to the reviews. All three wines are from California and were released on November 1, 2013. They each have an SRP of $10. Availability is limited currently, but they will be widely distributed and likely available for a couple dollars under the SRP. 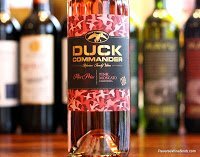 The wines are produced by Duck Commander – Robertson Family Wines in conjunction with Trinchero Family Estates. All three were samples submitted for review. First up is the 2012 Duck Commander Miss Priss Pink Moscato which is primarily Moscato with a dash of rosé wine. 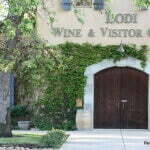 The wine did not go through malolactic fermentation and was cold fermented and aged in stainless steel. It has a residual sugar of 8.0 gm/100ml. “The Robertson’s, of TV’s Duck Dynasty fame, live out the American Dream while staying true to their rugged outdoorsman lifestyle and Southern roots. This wildly successful Louisiana bayou family has remained grounded in what matters; God, family and friends, good food and fun. Pair your good times with The Robertson’s Miss Priss Pink Moscato. Stone fruit aromas, lead to lush flavors of passion fruit with a hint of vanilla. The 2012 Duck Commander Miss Priss Pink Moscato begins with a sweet and fruity aroma of strawberry, raspberry, orange and watermelon Jolly Ranchers along with a lot of honeysuckle. The wine tastes sugary sweet and juicy, perfect for today’s sweet Moscato lovers. It features lots of mixed berry flavors along with a hint of tropical fruit balanced by nice acidity. It ends with more sweet notes and good length. This is a crowd pleasing wine that is really easy to drink — almost too easy actually, it’s a good thing the alcohol level is only 10%! Next up is the 2012 Duck Commander Wood Duck Chardonnay, which went through partial malolactic fermentation and was aged sur lie with the majority of the wine spending time in oak and the remainder in stainless steel. It has a residual sugar of 0.9 gm/100ml. Pair your good times with The Robertson’s Wood Duck Chardonnay. Vibrant tropical fruit aromas, lead to lush flavors of crisp apple and pear. The 2012 Duck Commander Wood Duck Chardonnay begins with pleasant aromas of apple, pear, mango and a little grapefruit. Tasting reveals a very nice all-around, all-purpose Chardonnay. It’s mostly fruity but it also features a bit of a spicy streak that adds complexity. There’s a touch of wood and even a hint of butter on the long finish. 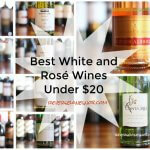 Another very tasty wine that is sure to be a crowd-pleaser! Last is the 2011 Duck Commander Triple Threat Red Blend, a blend of Zinfandel, Merlot and Cabernet Sauvignon. It has a residual sugar of 1.2 gm/100ml. Pair your good times with The Robertson’s Triple Threat Red Blend. 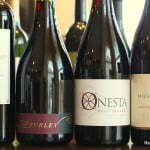 Fruit forward, silky and soft with fresh ripe, jam-like fruit flavors. 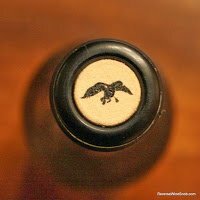 The 2011 Duck Commander Triple Threat Red Blend begins with lots of ripe fruit plus caramel and coffee aromas along with a bit of spice. Tasting reveals more ripe fruit, lots of chocolate and caramel notes along with some cherry cola and spice. It’s all wrapped up in a smooth texture with soft tannins. It ends with more jammy ripe fruit, good length and sweet oak notes. 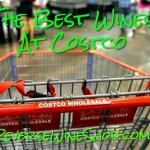 This wine hits the inexpensive red blend bullseye — if you’re a fan of Apothic Red, Cocobon or the Murphy-Goode Homefront Red you’ll love it! The verdict? All three wines are very good representations of three popular styles. There’s nothing ground breaking about any of them but they are all executed extremely well and as such I can see these becoming very popular. If you are a fan of any of these styles (and most people are) you’ll find a lot to like here. 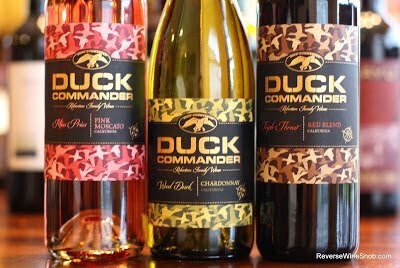 In my opinion Duck Commander Wines are the real deal!